The Historical Society of Rockland County (HSRC) will open the doors to the 1832 Jacob Blauvelt House on December 3–4, 2016, for the family-friendly St. Nicholas Day Program. 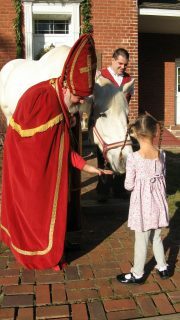 Children of all ages are welcome to celebrate St. Nicholas Day, as has been the tradition at the HSRC since 1961. This event, inspired by Rockland County’s early Dutch colonial heritage, is a highlight of the holiday season and a Rockland County tradition. Adults who visited with St. Nicholas when they were children now bring their own families. Each child receives a special treat from St. Nicholas in his or her shoe, and everyone can visit with St. Nicholas and his horse. Refreshments will be served. St. Nicholas Day programs begin promptly at 10:30 a.m., 12 p.m., 1:30 p.m., and 3 p.m. each day on December 5 and 6 and last about 45 minutes. Admission to the program is $5 per person (children and adults). Space is limited, and prepaid reservations are required.